January 25th, 2019 marks the date of Portland Opera Guild’s second luncheon for our season, and the event takes place at Multnomah Athletic Club. Cost for the luncheon is $38. and includes a three-course luncheon and opera program. Details of the guest artists will be added soon. 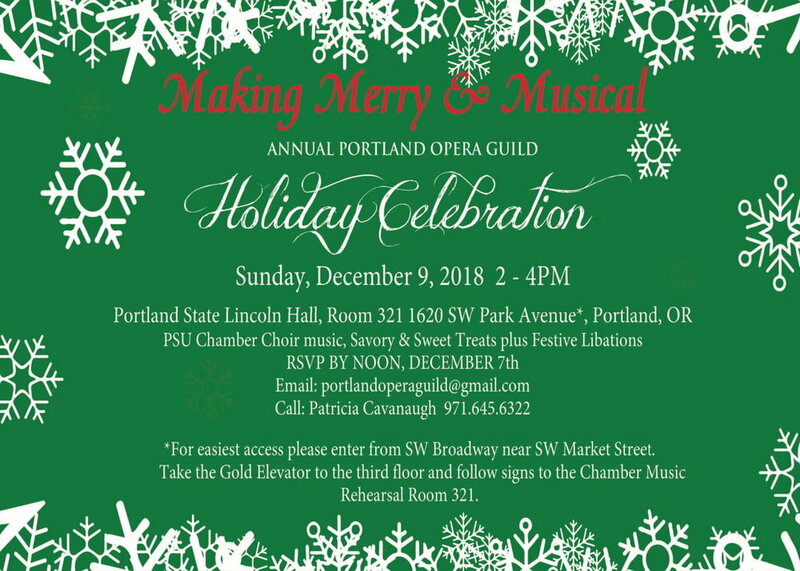 Join us for the Portland Opera Guild annual Holiday Celebration! Mark your calendar for Portland Opera Guild’s first luncheon of the 2018-19 Season. Enjoying a delicious three-course lunch in a lovely setting at the Multnomah Athletic Club with a wonderful program included is an exceptional way to spend an afternoon! On Friday, October, 19th, the Guild Luncheon will feature soprano, Amy Hansen, who will perform selections from La Traviata as well as other operatic favorites. Ms. Hansen has entertained us on several occasions, and always to rave reviews! Currently a faculty member of PSU’s School of Music, she will be accompanied by her colleague at the school, Chuck Dillard. Support Hannah, Saori, and Grace by attending a special fundraiser concert. All proceeds benefit the student artists' educational costs. The concert is being held at an elegant private residence in Eastmoreland in Portland. The address will be provided upon registration. The Astoria Music Festival is set in the charming small riverside town of Astoria, Oregon, where the Columbia River meets the Pacific Ocean. Metropolitan Opera soprano Angela Brown sings the title role in an intimate concert performance of Puccini’s beloved opera Tosca at the beautifully restored historic Liberty Theater with Met Opera veterans Richard Zeller (villain Scarpia) and Allan Glassman (painter Cavaradossi), and Deac Guidi (Sacristan), under the baton of guest conductor, the eminent Hungarian Maestro Imre Palló. The festival also presents Mahler’s Song of the Earth; soloists include Met Opera veterans MaryAnn McCormick and Alan Glassman with the Festival Orchestra — composed of musicians from the Los Angeles Opera, Oregon Symphony, San Diego Symphony, and more — under the direction of Keith Clark. Lastly, the festival schedule includes a mid-week intimate Candlelight Baroque concert with Portland soprano Arwen Myers at the historic Grace Episcopal Church, the Pacific Northwest’s second-oldest sanctuary. Graceful Baroque by Candlelight. Music by Bach and his contemporaries, performed on authentic period instruments in Astoria’s historic landmark (Grace Episcopal Church). Artists include Portland soprano Arwen Myers. June 19. In it’s 16-year history, the Festival has garnered raves from San Francisco, Los Angeles, New York, and London critics, and brought Astoria to national attention by winning the prestigious “American Prize for Opera” and “American Prize for Conducting”, as well as the Oregon Festival & Events Association’s Ovation Award for “Best Arts Festival”. For more details and tickets, please visit astoriamusicfestival.org or call the Festival office (503)325-9896. Come enjoy our special Opera programs at Multnomah Athletic Club. Each luncheon will feature an opera program, as well as news of opera events in the area. Cost for the lunch and program is $35.00 per person. Come enjoy our special Opera programs at Multnomah Athletic Club Londsdale on the second floor. Patricia Cavanaugh plans a lovely afternoon of food, décor and a beautiful program performed by Grace Skinner mezzo soprano, recent graduate of PSU school of Music and Erik Standifird, baritone, studying at PSU School of Music of some of our favorite arias as well as lighter fare. Get your tickets for PSU Opera Program's matinee performance of Cinderella on December 10th, then join us at Nel Centro Bar, Hotel Modera, 1408 SW Sixth Ave. in Portland. $5.00 Valet parking is available. The Annual Portland Opera Guild event for members and guests takes place on Sunday, December 3rd from 2:00 pm - 4:00 pm. We will enjoy holiday treats, including a Holiday Music program from members of the Portland State University Choir. If you have not received your invitation, please contact Patricia Cavanaugh by phone. (Her number is in the new Directory members received recently) or contact her by email at portlandoperaguild@gmail.com. Please let us know you will be coming, and if you will be bringing guests and prospective members by December 1st, 2017. Fall is here! Join us for our wonderful "Fall Classic" luncheon on November 10. This luncheon will take place in the “Lownsdale” room on the second floor of the Multnomah Athletic Club located at 1849 SW Salmon St, Portland, OR 97205. Reservations must be made by Tuesday, November 7, 2017. Guests arriving without a registration will be subject to increased admission cost of $40 per person and are subject to space limitations. Questions? Contact Patricia Cavanaugh at portlandoperaguild@gmail.com. Members of the Portland Opera Guild who donate at the $50 level and above are admitted free to MONC. General admission is $20.